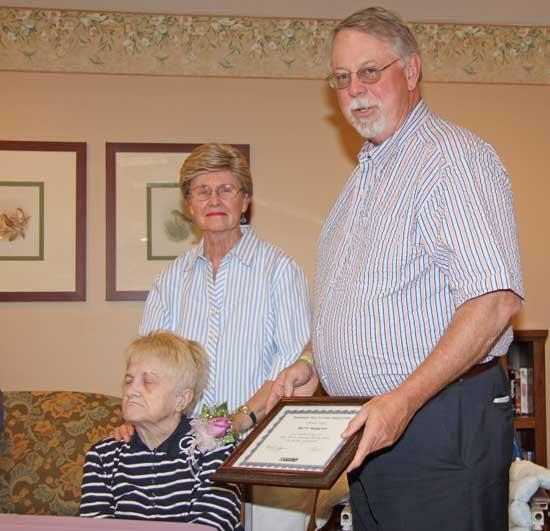 Betty Webster, seated, receives a certificate of honor from James Adkins, administrator of Woodbury Nursing Center, as family friend Sondra Wilcox joins the celebration Friday. Woodbury Nursing Center has chosen Betty Webster as their nominee for "Outstanding Nursing Home Resident" of 2010. On Friday, May 14, she received a certificate and a tea in her honor at the nursing center. Betty and her twin sister, Margaret Anne, were born to Rev. and Mrs. Ellsworth Rinehart Webster in Knoxville. She spent the first 12 years of her life in Loudon, Tennessee, where her father was the beloved pastor of First Baptist Church. From Loudon, the family moved to Memphis where they opened the Baptist Children's Home. From that time forward, Betty became a children's advocate for the rest of her life. After finishing high school in Chattanooga, she worked at Interstate Life Insurance Company where friends urged her to go to college in order to prepare for a job in education. Following graduation from Middle Tennessee State College she began her career at Tennessee Preparatory School in Nashville. She taught physical education and, drawing on her background as a member of the state championship band from Chattanooga City High School, she began a drill team at TPS which performed at the high school level and in local parades. After completion of her M.A. degree at George Peabody College, she accepted a position at Belmont College in Nashville and later taught at David Lipscomb College for 11 years. Even though she had the opportunity to prepare other educators, she still desired to work with small children and accepted a position in physical education at McFadden Elementary School in Murfreesboro. Her annual programs which included all 600 students were well known and attended by standing-room-only crowds. No child, regardless of poor condition or disability, was left out. Webster later received her Ed. S degree (Specialist in Education) from Middle Tennessee State University and was honored by the Middle Tennessee Association of Health, Physical Education and Recreation for outstanding contributions to her profession. In addition to teaching Sunday School classes, she prepared a bulletin board for church which honored all men and women who were in the service of our country, including their photos, family members and their addresses. Betty's passion for teaching continued, and she demonstrated this by organizing English classes at North Blvd. Church of Christ and carried cards and flyers wherever she went inviting people to come to her free classes. Four years later she was still calling about the classes. Her passion for serving others expanded, and she often prepared food and entertained as many as 50 people in her home. One goal was to bring people together from different nations so they might experience Christian fellowship and learn about Christ. Many Chinese and other nationalities considered her part of their families and have come from as far away as Ohio, Kentucky, Wisconsin and Texas to visit her since her confinement to the nursing home. Alzheimer's Disease, which has its onset at the age of 67, has robbed her loved ones of a bubbly personality (she never met a stranger) and has left a huge void in their lives which can never be replaced. They consider themselves better people for having had the honor and pleasure of her company.